Like all episodes of Black Mirror, the end of “Hang the DJ” offers up a closing twist that forces the audience to rethink everything they’ve seen so far. The setup and the flip work like this: Two attractive young people named Frank and Amy meet on a date, and we learn they’ve been matched together by a compatibility algorithm known as the “System.” They have a really good first date, but the System also gives their relationship a quick expiration date, so they part ways and move on to seeing other people. No subsequent partner is ever as emotionally satisfying, and through various ups and downs, Frank and Amy decide they’re meant to be together, regardless of what the System wants to force on them. Near the end of the episode, Amy finally acts on her suspicion that their entire world is working against them, and urges Frank to join her in making an escape from the pastoral compound where they’ve been living. They flee to the edge of the compound, climb up a massive ladder while the world around them begins to disintegrate, and then they do as well, surrounded by dozens of dissolving identical Frank and Amy doppelgängers. In the last moments of “Hang the DJ,” we cut to a scene that suddenly registers as the “real” world, with real-life versions of Frank and Amy. They’re in a crowded bar, much less sanitized and sparse than the world-size West Elm catalogue we’ve seen for most of the episode. They look at their phones, and a dating app informs them that they’re a 99.8 percent compatibility match. The Frank and Amy we’ve been following this whole time, we realize, were computer simulations, merely one pair in a collection of 1,000 dating scenarios. In 998 of those simulations, Frank and Amy feel so dedicated to one another that they decide to rebel against the System, escape everything they know, and choose each other. In the real world, Amy and Frank look at one another and smile, nervous and excited and hopeful about the prospect of this nearly guaranteed magic relationship. 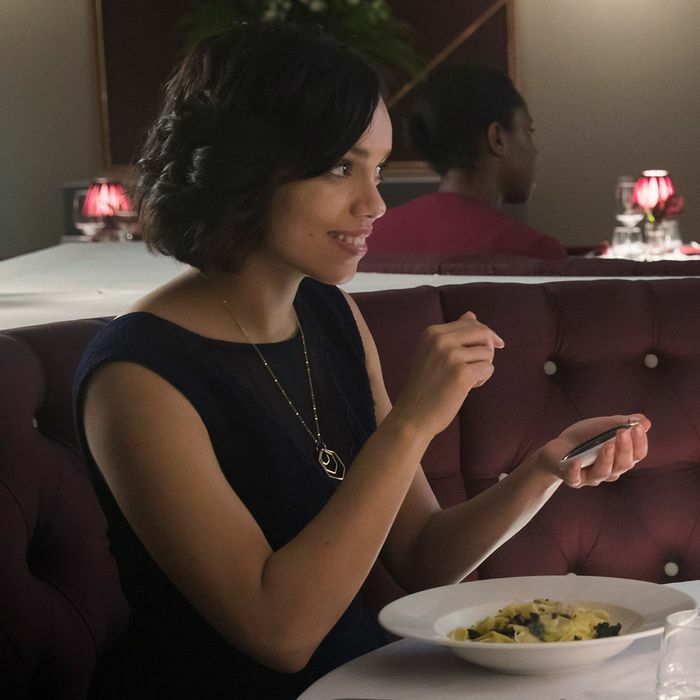 In the canon of Black Mirror episodes, “Hang the DJ” is most obviously in conversation with season three’s standout hour “San Junipero.” In that episode, two women named Yorkie and Kelly fall for each other in a post-death virtual-reality world, and one of them forgoes her earthly belief system, deciding instead to live forever with her new love. “San Junipero” is far and away the most hopeful and optimistic of Black Mirror’s anthology-style episodes. Like the rest of the series, it plays with ideas from creator Charlie Brooker’s stable of obsessions: death and the afterlife, minds separated from their physical bodies, the complexity of human relationships when combined with paradigm-shifting technology. But “San Junipero” features two women making a difficult, painful, beautiful choice to be together, and that choice is enabled by the episode’s featured technology. Forced into a decision between old-school death and a virtual, potentially eternal life with a partner, tech lets Yorkie and Kelly live together for as long as they choose. “Hang the DJ” echoes many of those same themes. It’s about love enabled by technological advancement and two people choosing one another over the world they know. It’s also about choosing a partner in the context of a wide world of potential mates, especially after you’ve had previous serious relationships. It’s meant to be a hopeful episode, an optimistic story of characters valuing love over everything else. I tend to think Black Mirror is most interesting and most effective when it stretches itself to tell stories about technology as a potential good, rather than taking the easy route of “… and then everything was a monstrous nightmare.” In its own depressing way, that worldview is as simplistic and frustrating a conclusion about tech as its Silicon Valley–fueled “tech can save us all” inverse. Thankfully, “Hang the DJ” is one of the good-hearted ones. It performs a lot of the same moves that “San Junipero” uses so effectively, most notably in the combination of hopefulness with a distinct splash of sadness at the end. We spend the whole episode rooting for Amy and Frank, only to watch them dissolve into nothingness, martyrs for a cause they did not choose. They weren’t real; their whole personhood was created and destroyed so that the original versions of themselves have a chance at happiness. That’s great news for the real Amy and Frank, but it’s a huge bummer for the Amy and Frank we’ve come to love. In “Hang the DJ,” the sim versions of Amy and Frank are built to be sacrifices, and the sadness of that is a lovely minor chord underneath the episode’s resolution. The problem with “Hang the DJ,” especially when you view it as a companion to “San Junipero,” comes down to the idea of choice. In “San Junipero,” hope and happiness come out of the protagonists making the conscious, informed decision to be together. Technology enables and informs that choice, but the final utopian vision depends on Yorkie and Kelly exercising free will in concert with this world-bending tech. “Hang the DJ” tries to do the same thing — the triumphant climax is Frank and Amy choosing one another, and they do it by deciding to thumb their noses at the Establishment and throw it all away for one another — but in the very next breath, the episode undermines its damn-the-man sensibility. The characters who actually make a choice, the Frank and Amy who actually exercise free will, get destroyed so their real-world counterparts can abdicate the decision-making power to an algorithm. Simulated Frank and Amy make the choice to fight the System, but real-world Frank and Amy end up embracing it. The chorus of the Smith’s “Panic” plays in the background of the bar where they meet, and its repeated exhortation to “hang the DJ” is a celebration of fighting the power and doing it for yourself. But in real life, Amy and Frank looked down at their phones and trusted an algorithm that they’re a 99.8 percent match. To root for their future together, we have to root for them to embrace the power of that algorithm. We have to root for them to blindly do whatever their phones tell them to do. Most of “Hang the DJ” argues that true love is rebellion. In that idea, and in the sweet sadness of simulated Frank and Amy’s sacrifice, this episode is a charming love story. When push comes to shove, though, the final twist of “Hang the DJ” muddles its own argument, asking us to cheer for insurgence while simultaneously hoping for its protagonists to follow the rules. Compared to most Black Mirror episodes, “Hang the DJ” may be a hopeful vision of love, relationships, and using tech to find love. It’s designed to make us cheer for real-world Frank and Amy, and honestly, I wish them the best. But I prefer the computer simulations who get to make their own choices.